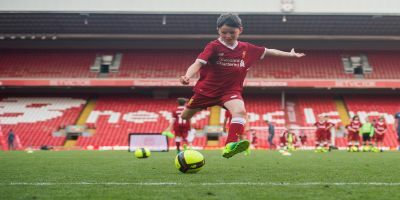 If your child dreams of following in the footsteps of first team stars such as Mohamed Salah, Sadio Mane and Roberto Firmino, now is their chance. LFC International Academy will be running a special LFC Soccer School at Anfield on Wednesday 16th May, giving young Reds fans an opportunity to play on the hallowed turf just like their heroes. The Soccer School will begin with all the participants walking out of the player’s tunnel and on to the pitch while the Club’s famous anthem, You’ll Never Walk Alone, plays over the stadium speakers. They’ll then receive an unforgettable two-hour session led by LFC coaches, teaching your child how to play The Liverpool Way. Time on the pitch will be spent participating in carefully designed practices covering all aspects of the game, while all participants will also leave with an LFC gift, a medal and a certificate signed by LFC legend and all-time leading goal scorer Ian Rush. In addition, participants will also receive a junior membership for the 2018/19 season. Places are sure to fill up quickly, so book now to ensure your child doesn’t miss out on this amazing experience.